Another month has passed and another My Little Box was delivered! The theme of this month was Goodnight, I absolutely love the vibe of it, the design is so sweet. I'm always surprised at just how much thought goes into these and they're always so unique! So onto the contents, starting with the lifestyle pieces! 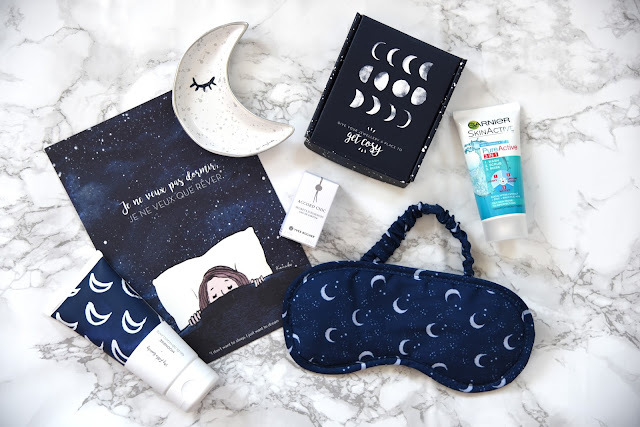 Firstly there was a Sleeping Mask, a girl can never have too many sleeping masks and I'm probably due a new one, this one is so cute, I love the moon pattern and the mask itself is super soft! My favourite bit of the box has to be the Jewellery Dish, this little ceramic moon guy is so so sweet! I am obsessed with the cute speckled design, I can't wait to put him out on my dressing table! For beauty bits, firstly there was a My Little Beauty Moonrise Makeup Remover Jelly, I've never used a jelly to take my makeup off before, I think it'll be like a cleanser and turn into a milk but I'm looking forward to giving it a go. Next there was a Garnier Pureactive 3 in 1 (150ml £5.10), I love the Garnier Micellar Water but haven't really tried anything else, this guy is supposed to cleanse, exfoliate and get rid of blemishes, although it is for oily skin whereas mine is dry so it's probably not for me! Finally there was a Yves Rocher fragrance mini, it's a bit too mature for me so I'll probably pass it along to someone else! Oh my, that dish is lovely! These boxes always look amazing, I dont know why I havent signed up yet!